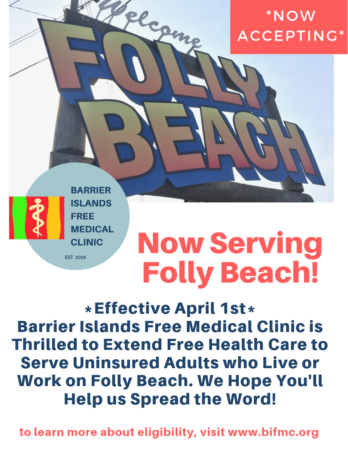 Barrier Islands Free Medical Clinic is thrilled to announce that as of April 1st, 2019, the free clinic will be accepting low income, uninsured adults who live or work on Folly Beach in addition to Johns, James and Wadmalaw Island. The announcement comes on the one year anniversary marking the expansion of the free medical clinic into a brand new, 7-exam room medical facility. Founded in 2006 by Drs. Charlie Davis and the late Arthur S. Booth, the free clinic set out to provide a medical home and continuing primary health care to uninsured adults living or working at or below 200% of the Federal poverty level on Johns, Wadmalaw or James Island. Since clinic doors opened in 2008, the Clinic has grown to serve over 4,500 uninsured patients across the lowcountry, treating patients with diabetes, hypertension, coronary disease, depression, and more. Patient services also include low or no-cost generic prescriptions as needed, and free imaging and scans provided by Roper St. Francis Hospital. All patient services and referrals are free of charge, thanks to donations and grants from the community and a large medical volunteer base. An affiliate of the Volunteers In Medicine organization, the clinic utilizes the volunteers efforts of 138 medical professionals and staff, many who have retired but still hold a license to practice in the state of South Carolina. Currently, Barrier Islands Free Medical Clinic provides free primary care to over 400 uninsured patients each month; the Clinic estimates that the new, seven exam room facility better positions the Clinic to accommodate more than 600 individuals per month. The Board voted to take on uninsured adults who live or work on Folly Beach in February. The Clinic continues to fundraise in order to outfit the new building with medical equipment and furnishings. Adults between the ages of 18 and 65 who either live or work on Folly Beach and do not currently have health insurance should call the clinic at 843-266-9800 or visit www.bifmc.org to learn more about eligibility. Barrier Islands Free Medical Clinic is a free clinic in Charleston, SC, that provides free medical care to eligible patients, just like any family practitioner or internist. The Free Clinic serves uninsured adults living at or below 200 % of the Federal poverty level who live or work on Johns, James & Wadmalaw Island or Folly Beach. You can follow us on Facebook, Twitter, Instagram and YouTube.